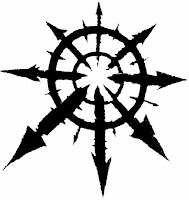 I first posted about a decent Traitor Guard Army list in November of '10, coming up with a master list the following February. In the next few weeks I'll endeavor to flesh that list out entirely. Today, we get a Fast Attack choice for those lost souls who have turned from the Emperor's Light: A Traitor Hellhound Squadron. While it goes without saying this entry is in no way tournament legal, endorsed or approved officially, it's strictly for fun -- which is what the hobby should be -- both for modeling and gaming! 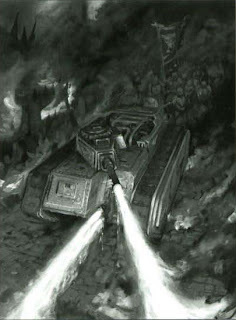 This entry was compiled largely from the current Imperial Guard Codex, Chaos Space Marine Codex, Eye of Terror Codex and the Imperial Armour Renegades and Heretics...Defenders of Vraks list from Forgeworld. Again, as no true models exist for these choices, they represent a great kit bashing modeling opportunity and extend the tabletop threat of the Traitor Guard. *Plague Cannon: Belches out a noxious, acidic cloud of hyper toxic bacteria so violently poisoness, it renders iteself inert, but not before inflicting horrific casualties. **Blastmaster: Focuses a basal note into an explosive crescendo that can burst eyeballs, rupture organs and warp armor. Varying the frequency changes the effects. Announce which frequency is employed when nominating the enemy unit targeted. +The dirge caster is automatically included with the Howler. This is reflected in its point cost. Kind of surprised you didn't go with a Doom Siren for the Howler, otherwise makes sense. What about a Tzeentchian version with a mutating flame cannon? For every whole model removed roll two D6 and any results of a nine create a Chaos Spawn. You could call it a Changehound or something. I have to admit, I started with a generic Chaos Undivided mindset like the CSM codex. The Howler is the shadow of the Guard's Devil Dog, so I wanted to keep it viable against some vehicles even without the Melta cannon. I LIKE the Tzeentchian wind-of-change thing a lot though! (maybe include the possibility of a "gibbering horde" being created too) I've got the HQ/Command Squad broken down into 5 possibilites -- Chaos Undivided and the four seperate powers. Once I get that out there, I'll revisit this and get Tzeentch in there. Thanks!